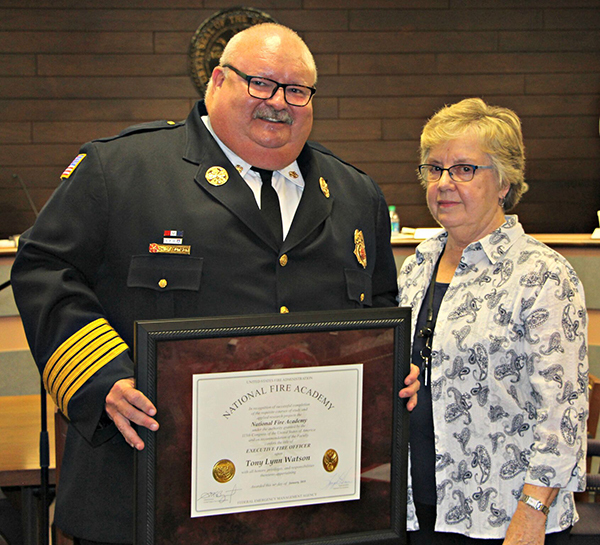 PIGEON FORGE, TN — Pigeon Forge Fire Chief Tony Watson has earned Executive Fire Officer (EFO) certification from the National Fire Academy (NFA). The U.S. Fire Administration, an entity of the U.S. Department of Homeland Security’s Federal Emergency Management Agency, oversees the NFA. The EFO program provides senior fire officers with a broad perspective on various facets of fire and emergency services administration. The courses and accompanying research examine how to exercise leadership when dealing with difficult or unique problems within communities. Watson began the four-year EFO program in 2013. He completed a series of four graduate and upper-division baccalaureate-equivalent courses taken over a four-year period. Each course is two weeks in length. Participants must complete an applied research project that relates to his/her organization within six months of completing each of the four courses. Watson was recognized for the distinction by Pigeon Forge City Manager Earlene Teaster at the Pigeon Forge City Council meeting on Monday, Aug. 13. Under Watson’s guidance, the city of Pigeon Forge earned national recognition in November 2017 as a Firewise USA™ site from the National Fire Protection Association. Firewise is a nationwide initiative that recognizes communities for taking action to protect people and properties from the risk of wildfire. Watson, a second-generation firefighter, began his career as a volunteer firefighter where he served 20 years. He has worked in emergency medical services (EMS), rising through the ranks to become the training officer for a growing advanced life support transport system, eventually becoming a multidisciplinary instructor in fire/rescue and EMS. He has served as an instructor at Walter State Community College and the National Fire Academy. In 2007, Watson was hired as chief of the Pigeon Forge Fire Department, the first person to serve in this role in an official capacity. Under Watson’s leadership, the department has grown from a mostly volunteer department to a combination department with 50 members. Watson is an active member of the Tennessee Fire Chiefs Association, and has served on the board of directors and as safety committee chairman. He also has served as vice president of the Sevier County Fire Chiefs Association. Watson earned his associate of arts degree in fire science from Walter State Community College, a bachelor of science degree in organizational management, and a master of arts in education degree in organizational training, the latter two from Tusculum College. He has attended courses and trained in wildland urban interface.